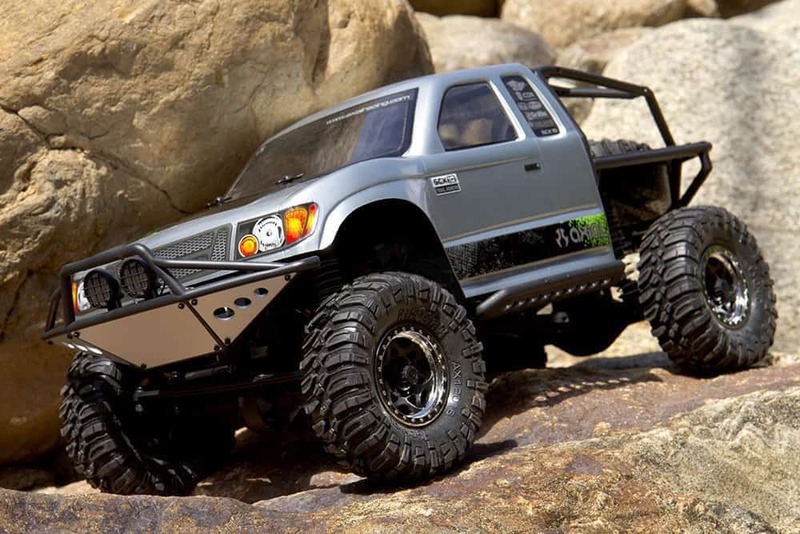 One of the reasons why RC rock crawlers have a more serious fan following than RC racers is because of the endless modification possibilities that come with it. To top it off, there is something inherently cool about watching an RC vehicle with oversized tires climb rocks, mountains and bridge barriers with the same intensity that an off-roader would. If it’s your first stint at RC rock crawling, then you are at the right place. Because we are going to show you the best RC rock crawler that you can buy. This decision is not an easy one to make by a long shot. 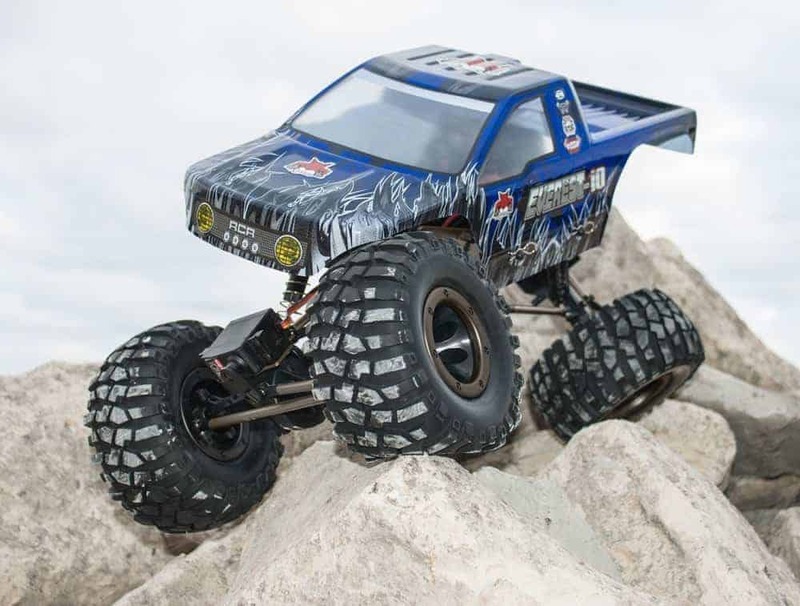 Because RC rock crawlers come in a variety of configurations, sizes, designs, modification possibilities and RTR versions. To make our choice, we have considered a lot of factors including the ease of use, the type of wheels, the differential, hobby grade or not and customer ratings. After careful consideration of all the above-mentioned factors and speaking to mods at online RC forums, owners of RC rock crawlers and hobby enthusiasts who have spent their life tinkering with these monster trucks, we have finally narrowed down on our list of the best. Here they are. Redcat Racing’s Volcano had set some pulses racing when it first arrived on the market. The Everest-10 just amplifies the quotient further with a mean 4 x 4 that can tackle just about anything you throw at it. To top it off, it comes with nearly endless mod possibilities. 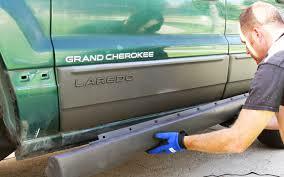 Irrespective of whether you like to add a custom paint job or add some power below the chassis, it is very easy to do. Having seen RC crawlers that look, well, unworthy of being called one, the Everest-10 is a relief to the eyes. The chassis is the same one that is used on the RS-10 and features a sparkling red color with a hint of off-road sports graphics. On the front grill, you have the ACR emblem which adds to the appeal. Under the chassis, we have a 4-wheel drive (shaft-driven) that is powered by a single, brushed motor that is located bang in the center of the chassis. Aluminum Capped Oil Filled Shocks take the impact of the bumps as you encounter a nasty jump or two and the bead-lock crawling tires give it a fair amount of teeth that is a prerequisite in an RC crawler this size. On the power front, you have a 7.2v 2000mAh NiMh Battery that is joined to the chassis plate by four simple screws. You can just pop open the battery tray and replace it with something more powerful. Easy to do that. But as always, you’d be more interested in how this performs when put to the test on the ground. There is a lot that this beginner level RC crawler truck gets right out of the box. It is fast, can climb and can crawl like a beast. Those beaded tires certainly are a worthy upgrade from the ones on the RC-10. The trim is easy to set, and you should be able to get going with it in less than a couple of minutes. For beginners, this is a 4 x 4. So, all four tires will be spinning at the same speed since there is no differential. The articulation is top notch. Put a rock under one of the tires, and it will climb it effortlessly while the other three stay grounded. If you like to mod your trucks out of the box, you can start with the springs. But the tradeoff is that it will spin a lot more than it does now. 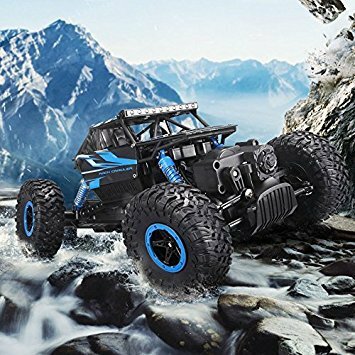 If you are new to RC truck crawling and are not looking to spend a bomb, then the Everest-10 is a great choice to start with. It is powerful, modifiable and can crawl as good as some higher end models can. Go for it. The Babrit Newer Racing car is perfect for beginner RC racers who are looking to dip their toe into RC racing with a crawler that’s not exactly hobby grade but isn’t a meek racer either. This is a 1/18 scale model that comes ready to race and offers a few possibilities for modding. But that does not take anything away from the performance. On rough terrain, the Babrit is a beast and on the tarmac, it takes off in a flash. The aesthetics are clearly aimed at crawler lovers with the strong PVC body, large sized tires that give it excellent grip and skid resistance even when you suddenly encounter an uneven patch in your path. The four wheels are based on an independent suspension that allows it excellent ground clearance and articulation. To ensure that the body can take a few bumps in its stride, the Babrit boasts of heavy duty shock ups that also keep the electrical components safe. 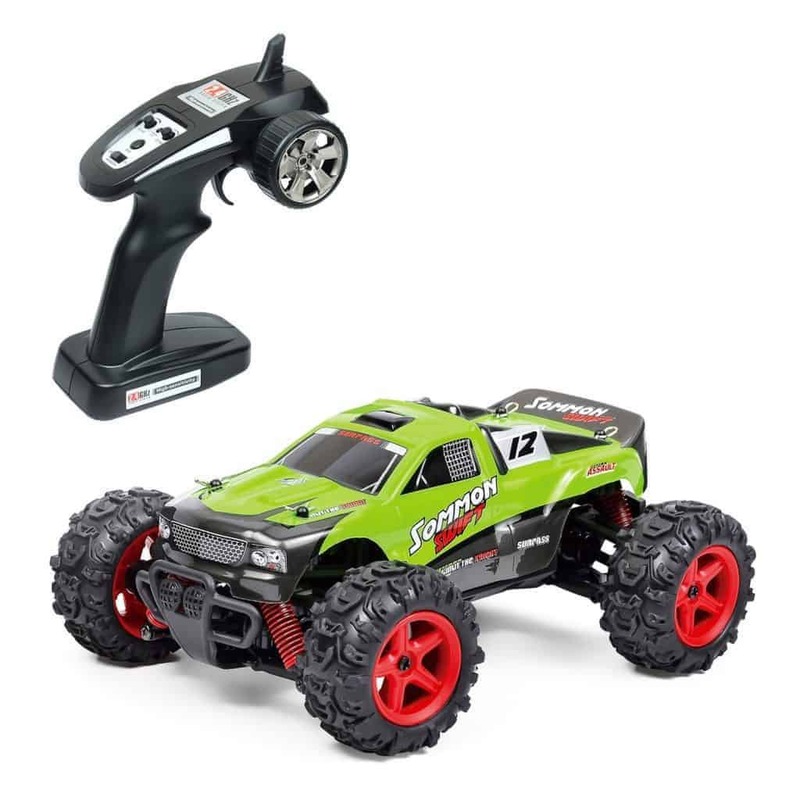 It has a top speed of up to 5 mph which is excellent for an RC crawler at this price point. Put it to the test, and the Babrit will impress the hell out of you with its performance. Take it through dirt, rocks, sand, water or mud, and it climbs as good as heavy duty hobby grade crawlers do. The controls are fast and responsive, and there is no lag or over spin which can kill the fun element, especially if you are a beginner. It runs up to 15 minutes on rough terrain and slightly longer on the tarmac on a full charge and charging takes up to 2 hours. If you are looking for a spare battery pack which you will eventually need because once you start running this, you won’t be looking to stop for at least an hour, you need to remove the chassis, and the battery is attached to the tray right underneath. The Babrit New 2.4GHz racer eliminates the learning curve attached with running an RC crawler and makes it a fun ride instead. It is a perfect beginner’s RC crawler. Great pricing too. Built on Axial’s extremely popular SCX10 platform, the Honcho is a ready-to-race 1/10 crawler that ventures into pure hobby-grade RC crawling and offers a stellar performance on the ground. It can be modified from the ground up making it a hobbyist’s choice. But even if you are a beginner looking to go beyond your RC toy, it won’t overwhelm you, and it is perfect to use out of the box. At the forefront is the ladder frame chassis that is tried and tested with the SCX10 platform. The two C-channel steel frame rails make it light but extremely capable on trail climbs. If you run this off into a pit or it takes a nasty tumble, the Honcho will just dust off the tires and go climbing again. The all-plastic scale grade body is a looker for sure, but it can take more than a few scratches to show. To keep up with the scale design, Axial has reduced the tire size to 1.9 inches. But this can easily be upgraded to a meatier 2.2 which will allow it to scale more obstacles. To be honest, it looks perfect the way it is. There are two bright LEDs on the front and two red ones on the rear which add to the appeal. It is not the fastest RC car you will have driven. But it is meant to climb and not race. What makes the Honcho the perfect hobby grade RC crawler is the near-perfect components that it comes with. Everything from the 80 tooth spur gear and the 20 tooth pinion gear, the 27 turn brushed motor, and the drag break are designed purely for performance. The electricals are not waterproof, though. So you’d want to keep the Honcho away from that deep end of the puddle. Having said that it can blast through small puddles with ease. 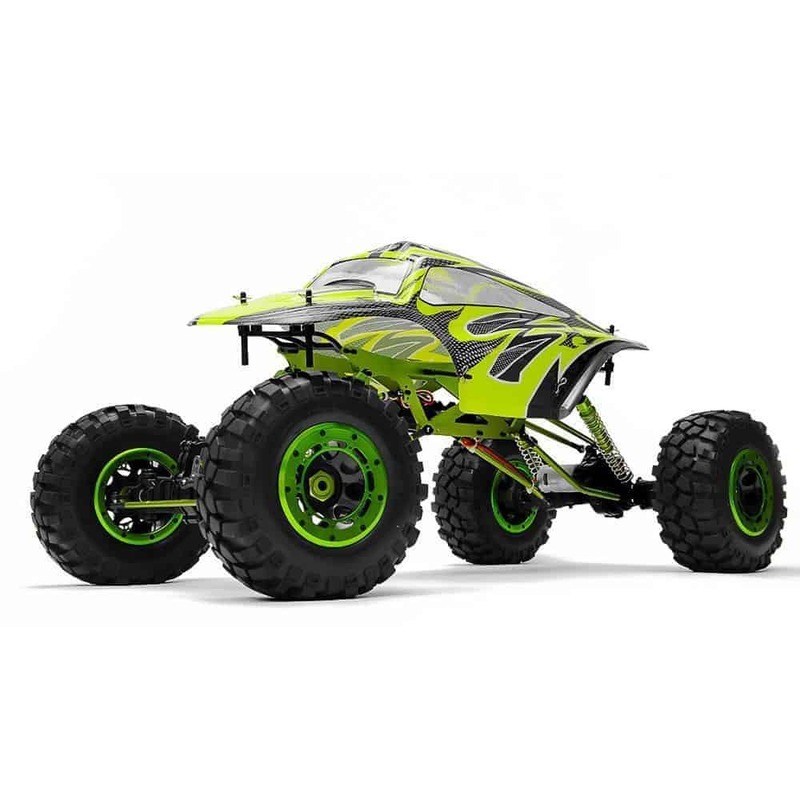 Axial has been a standard choice for hobby grade RC crawlers. And the Honcho stays true to their reputation with a perfect performance out of the box. It bridges the gap between hobby grade and RTR with its ‘all-inclusive’ package. For mods, though, there’s enough scope to alter their rigs. Racers who prefer the adrenaline more than the slow paced crawls should check out the Metakoo RC car 1:24 Scale model. As the name suggests, this is a very fast racing car. It has a top speed of 40 km/hour and runs for up to 40 minutes on a single full charge. It is designed to look like a crawler too. So if your child just wants something that resembles a crawler but runs like a racer, this is it. The Metakoo RC car is a racer from ground up. It is bright, flashy and has sporty graphics with a slightly large tire that can take a few minor obstacles. The chassis is a very light weight but durable plastic that can sustain crashes. It is a scale model, so it looks extremely realistic when it’s racing, and it is also available in a few different color options. This is a 4-wheel drive which means that all four wheels turn at the same time. This gives it unmatched maneuverability on rough terrain. On tarmac, the Metakoo really stands out over larger sized racers. It is evident that the Mekatoo RC car is not designed for crawling. But, the manufacturers have made enough efforts to ensure that it does tackle a few obstacles on the way. The four-wheel independent suspension system & Tri-axial differential give you better handling power even when you are racing it at blinding speed. This also ensures that the car is stable and holds its ground rather than flipping up in the air at the slightest bump in the terrain. The tires with its grooves offer excellent grip on all types of surfaces, and the waterproof electronics allow you to take it into the water. The controls are fast and responsive, and the battery is changeable. This is an RC racer’s delight with a few traits of the crawler thrown in for good measure. It will keep your child entertained for hours and comes at a very good price for the features. If you are looking for an upgrade to your current RC crawler and you prefer a mean machine that can go anywhere, then you should check out the Exceed Maxstone. This is a huge crawler that boasts of Exceed’s powerful 1/8 MOA axles clubbed with large oversized wheels that will crush obstacles in its path and climb like a creeper. Compared to their last outing, Exceed has done a lot of work on the Maxstone. Everything has been beefed up, and this includes the chassis, the links, and the tires. Combine that with the 4WD articulation and you have a winner on your hands that will grab the attention of even the most seasoned RC crawler expert. The chassis will tower over meek competitors. It is strong, rugged and built for the rough outdoors. It is non-scale which means, that it doesn’t exactly score in the looks department. But it more than makes up with its amazing on-road and off-road performance. If you were to put the Exceed Maxstone to the test out of the box, you would be impressed. There is no need to change anything, and it will just race and crawl to perfection. Having said that, if you just cannot live with a stock setup, then there’s ample room for customization. Under the chassis, the Maxstone is equally impressive. The plastic gears found on the 1/8 scale version have been replaced by the meaty steel gears. For riding enthusiasts who prefer a 4W steering system, the identical front and rear wheel assemblies are a blessing, and you can easily modify this. Fully adjustable upper shock mounts and inner link mounts take the customization options to another level. You cannot be disappointed with the Maxstone. It is undoubtedly, Exceed’s most beefy model yet with the performance and the style to boot. This is for serious RC crawler lovers. Beginners are better off sticking to some of the earlier models that we have reviewed. rccrawler.com : The beginers guide to the MRC.